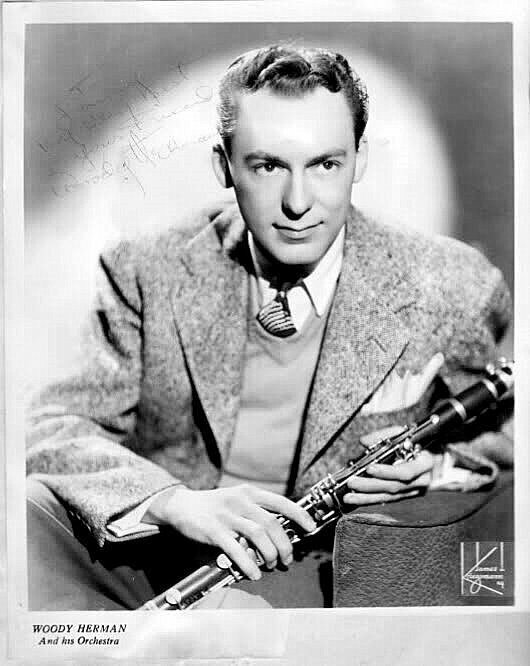 Woody Herman led big bands for a half-century, but in the beginning it seemed unlikely he would last more than a year or so. Herman spent his first years as a bandleader struggling to find both an audience and a distinctive musical style. Yet the early Herman orchestra was one of the better bands of the late 1930s and early 40s and had a special affinity for the blues. 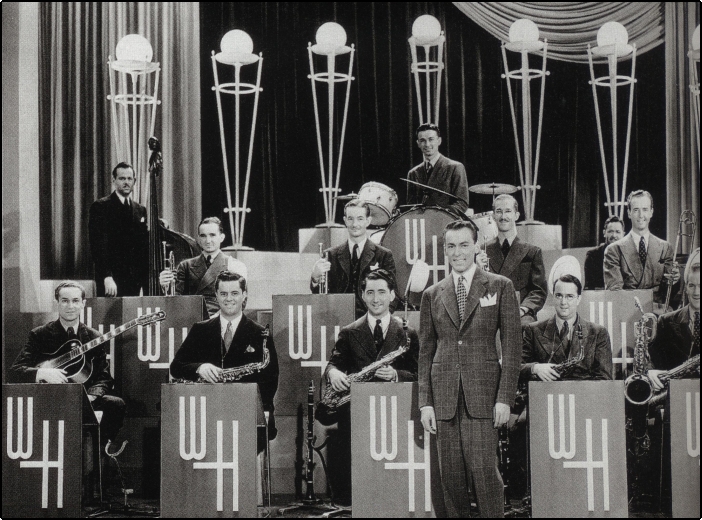 The beginnings of Woody Herman’s long career as a bandleader date to 1936 when he was playing saxophone and clarinet and singing in Isham Jones’ popular dance orchestra. After some two decades in the band business, Jones was ready to hang up his baton and retire from music. He was only 40 years old, but songwriting royalties from such popular songs as “It Had to Be You,” “Swingin’ Down the Lane,” “There is No Greater Love” made him a wealthy man. 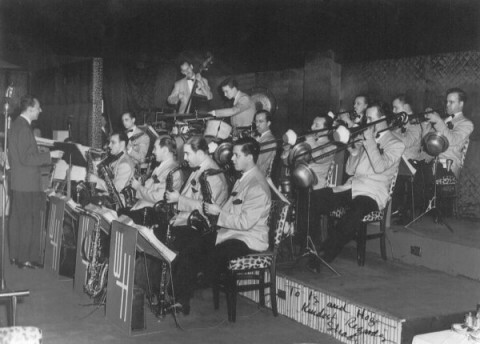 A group of the more jazz-oriented musicians from the Jones’ orchestra decided to form their own group and chose Herman as the leader. Even though he was the youngest at 23, Herman had been in show business the longest, having started as a nine-year-old singing, dancing and playing saxophone in Milwaukee and Chicago vaudeville houses. The new Herman band was a co-operative unit with each member owning a share of the group, which meant every decision was made by committee. They rehearsed for several weeks while wondering if they were ever going to land a job. Finally on Election Day, November 3, 1936, as Franklin Roosevelt was defeating Alf Landon in a landslide, the band opened at the Brooklyn Roseland Ballroom (not to be confused with the more famous Roseland in Manhattan). The young Herman orchestra got a record deal with the Decca label and started cutting sides a few days later. Although the band wanted to play jazz, their first half-dozen records were mostly tame, forgettable, sweet-styled numbers featuring Herman’s friendly vocals. The Herman band was a hit at the Roseland Ballroom in Brooklyn and moved up to Manhattan’s Roseland. For a while they played opposite an unknown band from Kansas City: Count Basie’s. Herman’s drummer Frank Carlson watched and listened closely to the loose and free approach of Basies’ great drummer Jo Jones, and that influence helped give the Herman band a lighter rhythmic feel than most swing bands of the day. Herman and the Count became friends for life and both led bands well into the 1980s. Even though they were “The Band That Plays the Blues,” Herman recalled that they had to fight to play them at the Roseland. The management wanted mostly fox trots, waltzes and rumbas to keep the dancers happy. According to big band writer and historian George T. Simon, Herman told the manager to get lost and quit bothering him. But he was so good-natured yet so firm and positive that the manager not only took it but also became one of the band’s biggest fans. Despite its billing, this Herman band played more than the blues. Their book was filled with romantic ballads, novelty numbers, dance tunes and Dixieland-style instrumentals reminiscent of the Bob Crosby Orchestra. But this meant the band didn’t really have a distinctive personality. It didn’t help that the group’s role at Decca Records was as something like the label’s unofficial house band. It cranked out covers of other group’s hit and backed up Decca’s singers, including Bing Crosby, Judy Garland, Mary Martin, Connie Boswell, the Andrews Sisters and others. In the fall of 1938 the Herman band turned two years old, but was still struggling. The musicians were so short of cash that one night while they were playing at a hotel in Cincinnati, they pooled their money and sent violinist Nick Hupfer across the river to Kentucky where there was gambling to win at poker. But he didn’t do too well and the musicians ended up worse off than they were before. The record would ultimately sell a reported five million copies, but it took a few years before it became a hit. In the meantime, the band’s struggles continued and so did face-offs with ballroom and theater managers who demanded softer, commercial dance music. Perhaps the biggest hindrance to the Herman orchestra’s efforts in establishing a stronger musical personality and public presence was its organization as a co-operative band. Although being a co-op created a strong esprit de corps, because each musician owned a share in the band, every decision required a meeting and a vote – often in men’s rooms. According to Herman biographer Gene Lees, even wives of the musicians had something to say about many minor matters, such as travel arrangements. It also proved difficult to get rid of musicians who weren’t working out. Bookings and record dates were sometimes messed up and opportunities missed. 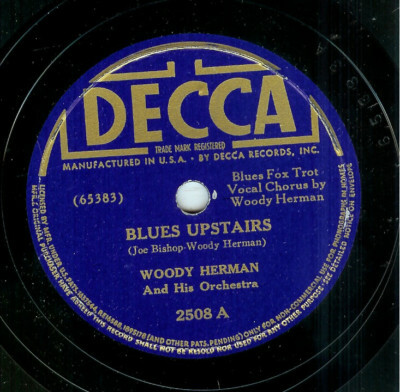 But in the fall of 1941 the band recorded “Blues in the Night” and it became an immediate hit, unlike “Woodchoppers’ Ball.” It was also the only Herman record to reach the top the charts. Finally after five years of scuffling, the Herman orchestra was becoming a popular name band. “Suddenly we got hot,” Herman said. “We played like we always had, but the customers suddenly began to act like they liked it.” Drummer Frank Carlson, one of the original members of the band, recalled that everywhere they played people screamed in appreciation. “The Band That Plays the Blues,” like all the other bands during World War Two, lost musicians to the military draft. However this gave Herman the opportunity he needed to take command of the orchestra. Herman was exempted from the draft because of a second hernia and as each member was drafted he bought his stock until eventually he had it all and complete authority. Because of the greatness of the bands that followed, Herman’s first group is usually given short shrift. It might not have been the most inventive and distinctive band of the Swing Era, but few could match its impeccable musicianship and easygoing swing. This entry was posted in Woody Herman. Bookmark the permalink.